So, after seeing how many favorites this thing gets daily, I have decided to move it out of the scraps section. Thanks to everyone who has faved it so far. It really means a lot to me to see that Kingdom Hearts fans get a kick out of it. Thanks for viewing and have a great day! ...what if Xehanort shows up? Oh well, at least I like his voice. This one's kinda pointless for me. I am a Keyblade Master. Hehe. I'm not scared! I have a Keyblade Antivirus! HA-HA! One question: how do you make this? i ask for the programs or any utilities. OMG!!! I totally want this on my computer. 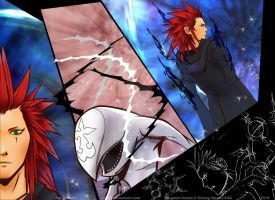 I dont care if it was just a joke, I want to Sora and Roxas! Screw that, I'll do it myself. 0.0 my life is complete. Cool. Are you the guy that does the Monty Python computer errors? but would calling the keyblade madster really help???? this is what we need to know. THE BUTTON DOESN"T WORK!!! I WANT MY RIKU! hmmm i wonder what would happen if i pressed both? Hmmm... Click Nah= annhilation... Click Help!= Bad*ss Keyblade Master... HELP!